Hi everyone, I hope you've all had a nice Easter and in a couple of days, the school holidays will have come to an end and 'normal' routines will pick up once again; at least we have two Bank Holidays in May to look forward to. Anyway, over Easter I began a new bullet journal (yay!) and decided to again, film the painting of the cover. I used a really pretty image of flowers in a vase (Sarah Raven) as my inspiration and then loosely followed it adding my own touches throughout. To watch, just click on the video below or follow this link if it's not viewing correctly below. If you'd like to see the first bullet journal cover video (see image above) that I created, just click here. I hope you enjoyed the video and hopefully it might inspire you to give this a go yourself with one of your sketchbooks or, even have a go at combining a bullet journal with a sketchbook like I've done. Please leave any comments on your thoughts or suggestions on bullet journaling, I always love to hear from you. How I've Combined A Bullet Journal, Diary AND Sketchbook! Do you find yourself being so busy day to day but not being very productive? Yes, I know that feeling all too well and I'm determined to change this around the best I can! Enter: The Bullet Journal! It's a simple system designed to help you 'track the past, organise the present and plan for the future'. 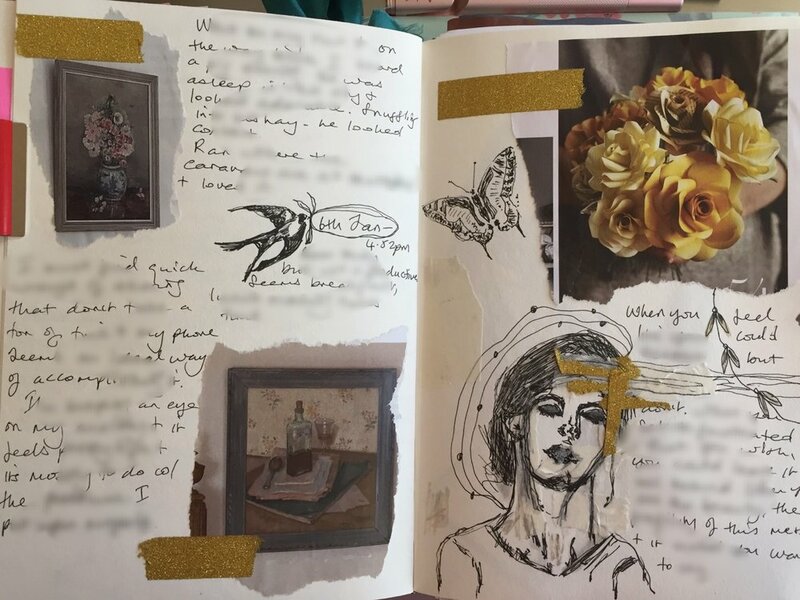 It was devised by Ryder Carroll and I think it's revolutionary and more so since I'm now combining my bullet journal, a journal/diary AND a sketchbook. I love it because everything is in one place and my mind doesn't feel like it's in 2,000 places at once - yeah, you have that feeling too? Incidentally, Ryder had been diagnosed in his childhood with Attention Deficit Disorder and this TED Talk video shares a little of his journey; I found it really fascinating and worthwhile. I'd also recommend the book that you see in the picture above - How To Bullet Plan by Rachel Wilkerson Miller. Whilst I haven't followed it to the letter by any means, it's been a good starting place for me. In case you're searching for a planner/sketchbook, I've been really pleased with mine - Daler Rowney Hardback Sketchbook, A5 150gsm. Please note: Some of these links are affliate links but I only use these on products I actually endorse and use myself.